We have enriched knowledge about the purification of water glycol oil in various sectors. 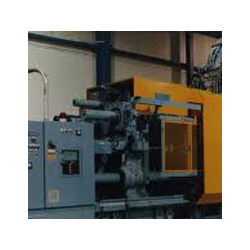 We completely remove the contamination without affecting the Fluid properties. 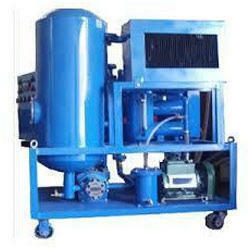 We Process of Reclamation and Filtration of Hydraulic Oil. Reclamation or the removal of water and particulate contamination from oil products is fairly straightforward and can be easily accomplished. Water can be removed from Hydraulic oils via reservoir settling, vacuum dehydration, centrifugation or coalescing. Methods to reduce particle counts include: reservoir settling, mechanical filtration,centrifugation and vacuum dehydration filtration. These methods are effective in removing contaminants, and they do not significantly reduce the additive content of the reclaimed Hydraulic Oil. 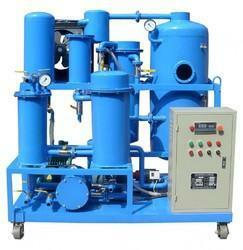 All of these can be reduced through a well-planned Oil Filtration Service.We are Giving the Best Filtration Service. 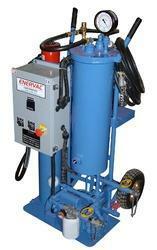 While hydraulic system contaminants can be either solid particles or liquids, water is the most common. 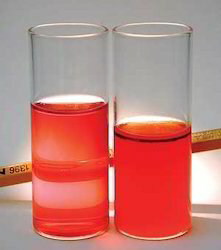 Solid particles contaminate by chemically reacting with the fluid, or fouling the system through accumulation. For instance, a new hydraulic fluid can contain 500,000 particles per 100 ml that are 5 µm or larger, which exceeds the level recommended by most manufacturers for normal operation.3 Unfortunately, 0.5 µm particles can be harmful to most systems. Due to the wide range of hydraulic fluids, many standards for cleanliness are available, which compounds the problem. For example, MIL-H- 5606F requires that in 100 ml of fluid there be no more than 10,000 particles ranging between five to 15 µm, no more than 1,000 particles between 16 to 25 µm, and no more than five particles over 100 µm. With the help of our professionals, we are engaged in providing a wide range of Flushing Oil Purification. Our offered Flushing Oil Purification is carried out by our professions keeping all quality standard in mind to get the process completed on time. Our clients can avail this Flushing Oil Purification from us at good price range. The Process of Reclamation and Refortification Reclamation or the removal of water and particulate contamination from oil products is fairly straightforward and can be easily accomplished. Water can be removed from turbine oils via reservoir settling, vacuum dehydration, centrifugation or coalescing. Methods to reduce particle counts include: reservoir settling, mechanical filtration, centrifugation and vacuum dehydration filtration. These methods are effective in removing contaminants, and they do not significantly reduce the additive content of the reclaimed turbine oil. Clarification of Terms Reclamation refers to cleaning and reconditioning of a lubricant, thereby rendering it suitable for continued use in the same application for which it was originally formulated. In the industry today, reclamation normally refers to the removal of water and solid particles from the lubricant. 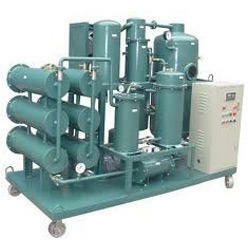 All of these can be reduced through a well-planned Oil Filtration Service.We are Giving the Best Filtration Service. 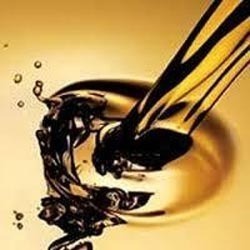 Turbine Oil Formulations Formulating turbine oils is not a difficult science; however, it does require a delicate balance of the correct additives and base oils. In today’s market, most turbine oils are formulated with API Group II base oils and contain less than two percent additives (Figure 1).The addition of oil soluble foreign materials to the product can upset the balance of the formulation, and adversely affect product performance. Figure 1. Turbine Oil Composition At first glance, one would think that the quality of turbine oil in a newly commissioned turbine is a nonissue and the oil should last for its designed service life; however, this is not always true. In some cases, to reduce costs, contractors select turbine oils which meet only minimum original equipment manufacturer (OEM) requirements for the application. These products can have a reduced service life as the oil undergoes thermal and oxidative stresses. In some cases, this may require change out or refortification of the turbine oil in less than three years of service References 1. McNeely, M. “The Coaster Ride Continues Downhill.” Diesel & Gas Turbine Worldwide, October 2003. 2. Designation: D4378-97. “Standard Practice for In-Service Monitoring of Mineral Turbine Oils for Steam and Gas Turbines.” Annual Book of ASTM Standards, Vol. 05.02, 2002. 3. Being a quality conscious firm, we are offering a quality tested array of Industrial Oil Purification. The Industrial Oil Purification we offer is widely demanded amongst the clients for its availability in various specifications and also for its reliability. Offered services are rendered accordingly as per the requirements of the clients. Widely demands Lubricating Oil is offered to customers in safe packaging in order to maintain their longer shelf life. The offered Lubricating Oil is extensively used for lubrication of various internal combustion engines and oil in a container that once held chemicals. We are instrumental in offering Oil Purification and Dehydration Service to our valuable customers. Known for their timely execution and optimum effectiveness, these services are executed using advanced tools and equipment by our team of professionals, which hold expertise in its operations. 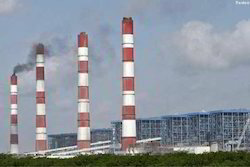 Offered by us at cost effectiveness, these services are highly demanded in the oil & gas industries. With the aid of diligent experts, we are able to bring forth pristine range of Industrial Oil Separation Services. Offered separation service is highly reliable & cost effectiveness among customers. Our experienced professionals execute this separation service as per the specific needs of our patrons. Also, our experts work in perfect coordination with the customers so as to deliver a perfect range within a given time frame. Looking for Industrial Oil Purification Service ?